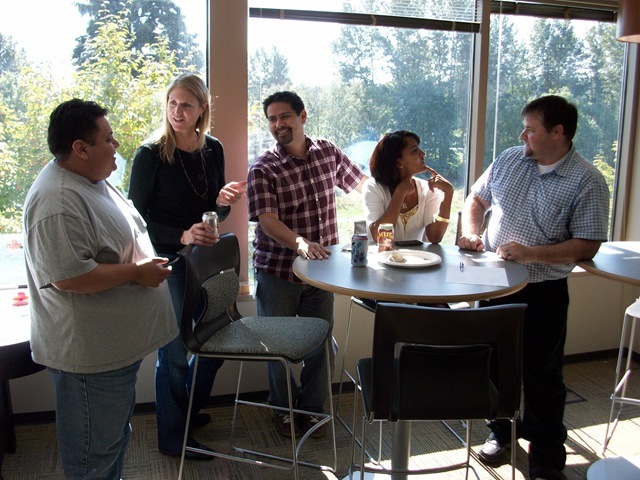 Yesterday was the kickoff of the new Monthly MEC Mixer Monday (Mmmm) events at various locations around Microsoft in an effort to get localized networking off the ground. Our hope with these events is to provide a regular event at multiple locations, so that no matter where you are on campus or around the world, MEC members can get together and discuss topics that are important to them and their teams. All events are held on the same day, same local time (11:30am to 1:00pm). There are no agendas, no formal programs — just drop in, meet people, and talk. One of the benefits of this format is meeting MEC members outside of your own organization – and outside of your building. The attached photos are from the Mmmm event held in Redmond Town Center. Other locations holding Mmmm events yesterday include Buildings 37, 43, and 34, Westlake Terry (downtown Seattle), Redwest, Millennium, New York, and Dublin Ireland. In October, we’re looking to add Sammamish and Advanta locations here in the Puget Sound, Charlotte NC, Las Colinas TX, Mississauga Canada, Singapore, Germany, and the Netherlands. So…you attended the Foundation Event, joined the Management Excellence Community (MEC), and now what? How do you stay engaged? Why not participate in a monthly networking event – just for MEC members – in your local cafeteria? 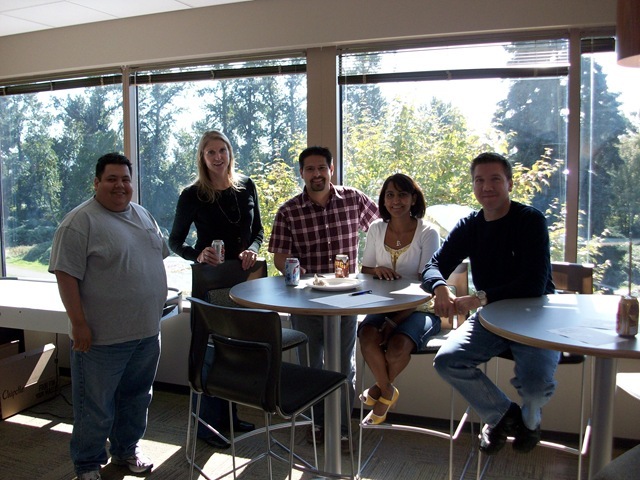 The Monthly MEC Mixer Monday (Mmmm) is being launched this month (September 2008), with 10 locations currently planned worldwide. The goal is simple: wherever you are in the world, on the last Monday of the month from 11:30am to 1:00pm, there is (or will be) a MEC Mixer nearby. Another 5 sites are being proposed for October (Sammamish, Advanta, Germany, 50, and 25). If you’re interested in attending one of these events, please contact the appropriate host to be added to the DL or meeting invite. And if you’re a MEC member and would like to help launch an event in your Microsoft building, please take a look at the event overview (available on MECweb under Make an Impact, Get Involved), or contact me directly (cbuck@microsoft.com). You are currently browsing the archives for the MEC Mixers category.